The Stripes pitch-off is hosted by the Stripes Group, a leading growth equity firm based out of downtown NYC. The winning team wins the opportunity to meet and interview with the Stripes Group recruiters over a dinner hosted in NYC. A big congratulations and well done to the team! 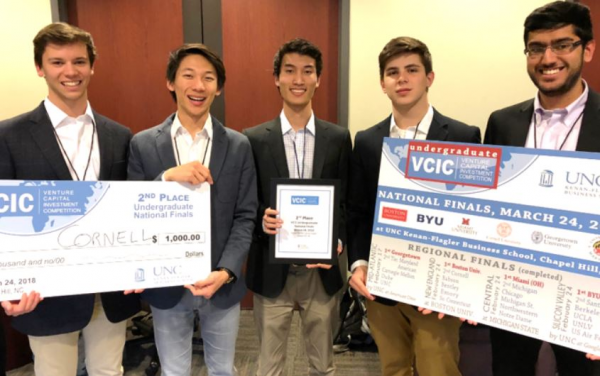 A team of 5 students from the Cornell Venture Capital club came in runners-up at the national Venture Capital Investment Competition (VCIC), held at the University of North Carolina. VCIC is a competition that allows students to step into the shoes of Venture Capitalists for a day. Over the course of the day, students meet with real entrepreneurs to conduct due diligence on potential investments in their startups, and partake in simulated partner meetings with judges who come from VC backgrounds. The team learned an incredible amount about VC funding, term sheets and negotiations. CVC hopes to field more teams at VCIC in the future, and will look to bring back the gold at the next round of VCIC. Congrats team! A contingent from CVC attended the Entrepreneurship Summit 2017 in New York City. Whilst in the city, various alumni also took the time to come and meet with the CVC team over lunch! We had a blast meeting with our alumni and learned a lot about the Cornell Entrepreneurship ecosystem and what it is like to be working in NYC full-time as VCs, PMs and financial professionals. Cornell Venture Capital hosted an event titled Experiences of Women in Venture Capital. The event was co-hosted with Forte, the undergraduate women’s business organization on campus, and featured two invited speakers - Crystal Huang (Principal, GGV Capital) and Jennifer Tegan (Partner/VP Finance and Administration, Cayuga Venture Fund). GGV Capital is a $3.8 billion multi-stage venture capital firm based in Silicon Valley and China. Cayuga Venture Fund is a venture capital firm specializing in seed to growth stage investments and invests in upstate New York startups from out of Ithaca. Both firms are partners of CVC. Crystal and Jennifer met with aspiring Cornell entrepreneurs prior to and after the event to provide advice and guidance on how to navigate venture capital funding. During the talk, both guests also provided perspective on what it is like to work in a traditionally male dominated industry such as venture capital. The event saw a fully packed 3rd floor of EHub Collegetown, and had a turnout of over 100 students. CVC would like to thank our co-sponsors, Forte, and we hope to bring more such events to the Cornell community in the future! CVC Alumni in New York City met up during the summer! It was a good time for members old and new to recount their CVC experience over brunch.